VilLA NM not a regular house, it is not meant for everyday living. It is a house for summers, for weekends, for stolen time. This is a house that you share with your immediate family, with your most intimate friends. The house is compact, as vacation homes often are: like the dacha and lake-side cabin of Russia and Scandinavia the house offers a simple, private, family and nature orientated retreat from urban life. There is none of the clutter of regular life; the house allows you to move through the pleasures of the day with unencumbered ease. 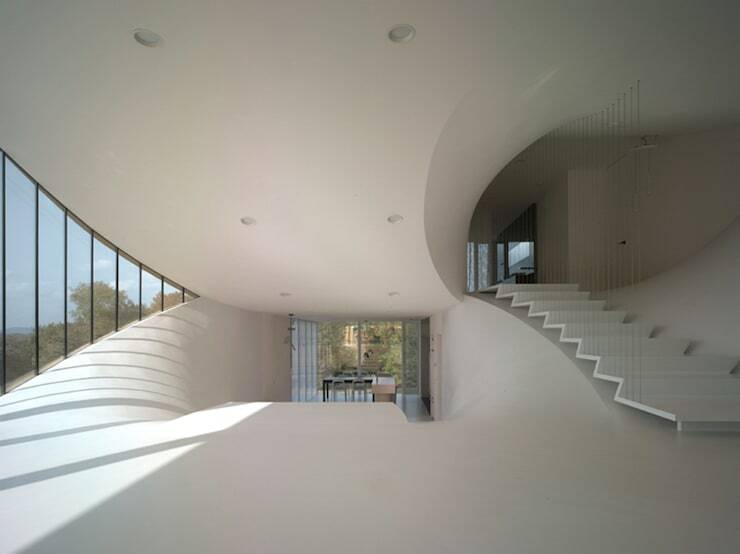 All white and smooth, VilLA NM is a futuristic hut; a rural retreat for a family of idealistic, glamorous urbanites. 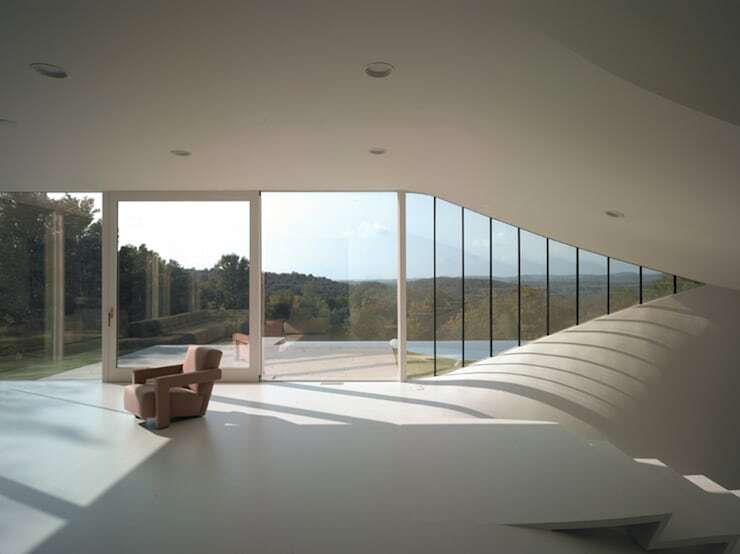 On top of the hill, the house affords a panoramic view over the surrounding landscape. Side walls consist of floor to ceiling windows that let in the light. 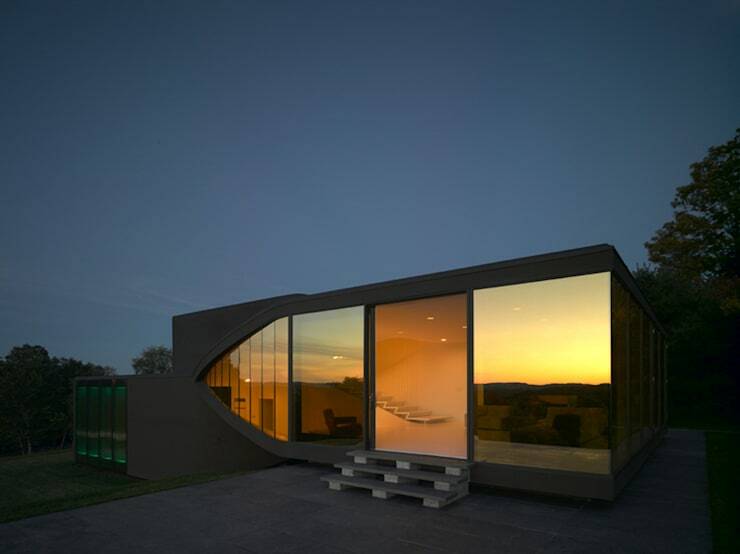 On the outside, the house is colored like the earth; its windows tinted like the sky at dusk. 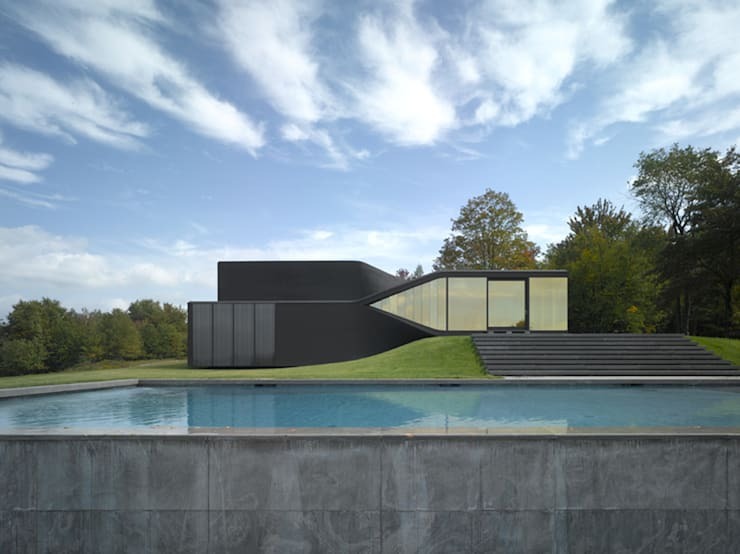 The building captivates the landscape. 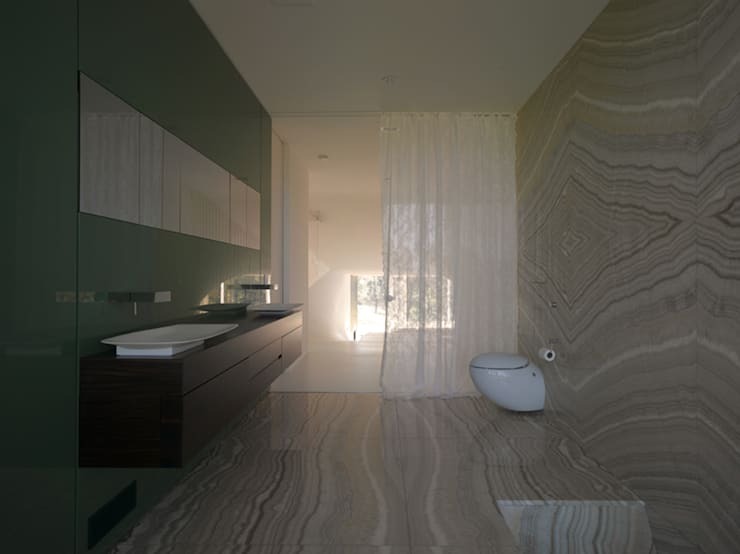 Inside the cool, white, flowing spaces of the house you are part of the landscape that changes around you perpetually. The private house commission has always been important for the development of architecture and still is a laboratory for innovation. 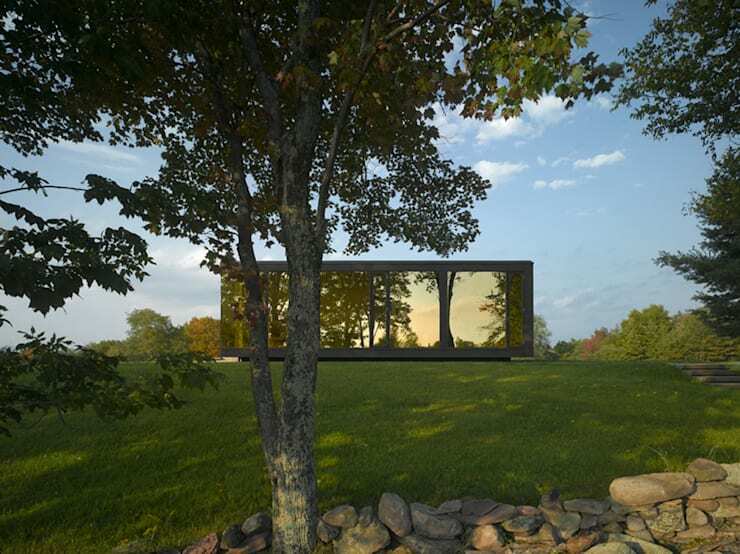 The family owning VilLA NM are enthusiasts for invention; they had seen the Moebius House in the MomA Exhibition The Un-private House and felt attracted by the idea of living in an experiment. The conceptual model for VilLA NM is a box with a blob-like moment in the middle; a twist in both plan and section that causes a simple shoebox to bifurcate into two separate, split-level volumes. 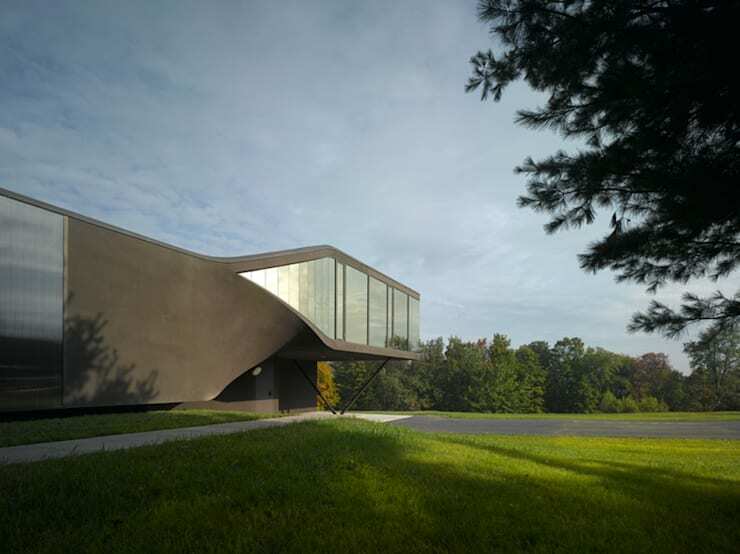 One side clings to the Northern slope of the hill, the other detaches itself from the ground, leaving room underneath for a covered parking space. All the internal spaces maximize the potential for wraparound views. 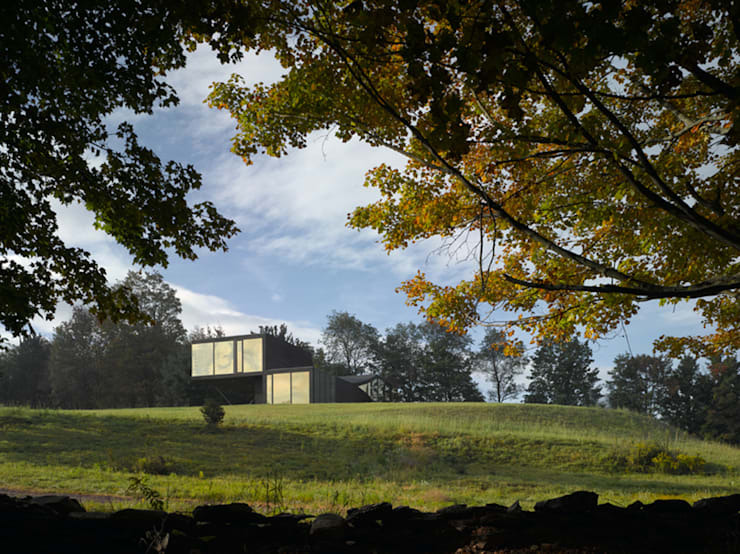 The kitchen and dining area on the ground floor are connected by a ramp to the living space above, the 1.5-meter (5 feet) height change allowing for a sweeping outlook over the surrounding woodland and meadows. A similar ramp connects the living area to the master and the children’s bedrooms on the second floor. Facilities such as the bathroom, kitchen and fireplace are clustered in the vertical axis of the house, leaving the outer walls free. Large glazed windows feature in all but the most private rooms. Technically, the volumetric transition is generated by a set of five parallel walls that rotate along a horizontal axis from vertical to horizontal. The walls become floor and vice versa. The ruled surface maintaining this transition is repeated five times in the building. Standardizing and pre-fabricating of this structural element lowered the building costs without reducing the spatial quality of the interior.